There is no better time than the present to anoint another Independence Bank Player of the Week. Independence Bank is proud to sponsor a weekly article highlighting players in the areas where Independence Bank flourishes who embody the same type of revolutionary service to their respective football teams which has made Independence Bank unique and special in the banking industry. Independence Bank has a goal of achieving everyday excellence, and this week we are focusing on a player whose performance both has and continues to exceed both the Daviess County High School’s and Owensboro community’s expectations. 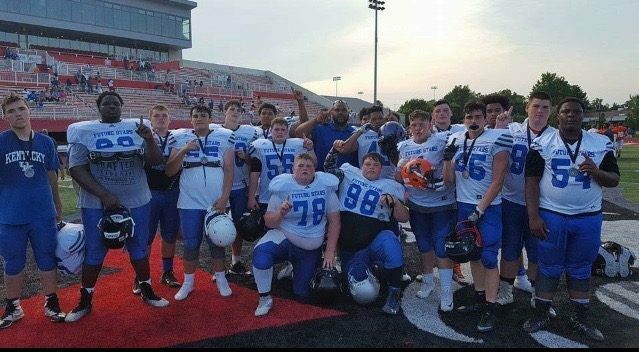 Today, we are focusing on Class of 2020, DT, Jon Stefanopoulos from Daviess County High School. Coach Matt Brannon’s Daviess County Panthers are located right down the road from 3 Independence Bank branches on 2425 Frederica Street, 2465 W. Parrish Avenue, and 3228 KY-54, respectively. We have been focusing somewhat here lately on linemen. There are good reasons for that. One reason is the big guys do a lot of work for very little fanfare. You can’t remember the last time you opened your local newspaper to see a story about a big-time player playing with his hand in the dirt. We aren’t saying it never happens, but it is far less frequently than we glorify skill-players. The second reason is the big guys along either the offensive or defensive front are chiefly responsible for the team’s overall performance. Jon Stefanopoulos, a virtual Greco-Roman gladiator of a lineman, stands 6-2 and weighs 345-pounds. Notwithstanding that prodigious stature and substantial weight, he still has registered a 40-yard dash of 5.3 seconds. 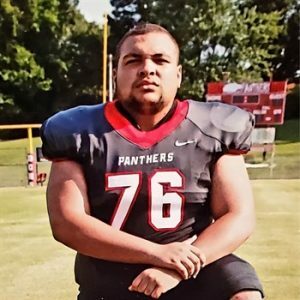 Jon bench presses 345-pounds, squats 515-pounds, and is athletic enough, as his highlights will certainly tell you, to play along the Panther defensive front anywhere from tackle to end. We really see “Big Jon” playing anywhere from the zero technique in an odd front to the 1-3 techniques in an even one. In 2018 as a junior, Stefanopoulos had 61 total tackles with 5 tackles coming from behind the line. Where he is aligned most of the time, that’s playing for a guy competing in Kentucky’s 6A classification. Congratulations to Jon Stefanopoulos for his Revolutionary Play which has earned this week’s recognition from the fastest growing bank in the Commonwealth of Kentucky…your friends at Independence Bank.